Ground round is one of the leanest of all the ground beefs. Its meat-to-fat ratios is 85 percent beef and 15 percent fat, making it perfect for this lightened up version of spaghetti and meatballs. Preheat oven to 375°. Coat a large baking dish with nonstick spray. For the meatballs, combine ground round, egg, bread crumbs, Parmesan, ketchup, onion, garlic, Italian seasoning, and pepper flakes; season with salt and black pepper, then form into 8 meatballs. For the sauce, sauté onions, bell peppers, and garlic in oil in a saucepan over medium-high heat until onions and peppers begin to soften, about 5 minutes. Add tomatoes, sugar, and pepper flakes; season with salt and black pepper. Simmer sauce over medium heat, stirring occasionally, about 15 minutes. Off heat, stir in oregano and basil. For the squash, cut squash into quarters lengthwise; scoop out seeds. Place squash quarters, cut side up, in prepared dish; season with salt and black pepper. Top squash quarters with provolone and meatballs. Coat foil with nonstick spray. Cover dish with foil, spray side down, and bake until a thermometer inserted into the centers of the meatballs registers 160°, about 1 hour. Spoon sauce over meatballs; top with Parmesan, oregano, and basil. To prevent dense meatballs, don’t overwork the ingredients. Mix them just until combined. To prep the squash quarters, remove the seeds. They come out easily with a large spoon. 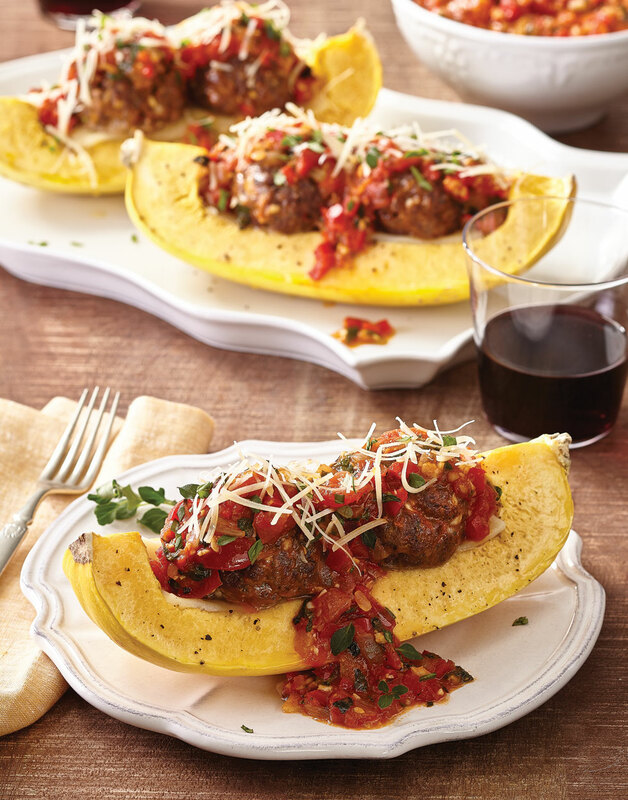 Fill the squash with the provolone first so the meatballs stay in place and have something to stick to.